If you've encountered a user that is breaking the Basic Rules of Disqus, use the "Report User" button to flag the account for Disqus attention. The person I want to report isn't breaking the Basic Rules of Disqus but is REALLY annoying, can I flag their account? No. Flag a user only if they're breaking the Basic Rules of Disqus. If they're really bugging you, you can block the user. Or, if they are violating the community guidelines of the site where you both comment, contact the site moderator. The person I want to report isn't breaking the Basic Rules of Disqus but is breaking the community guidelines of the site where we both comment, can I flag their account? No. Flag a user only if they're breaking the Basic Rules of Disqus. 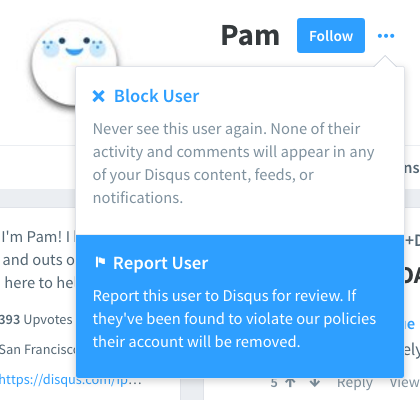 Disqus doesn't moderate the comments on sites that use Disqus, so you'll need to report the user directly to the site moderator. We also recommend flagging bad comments from the user; flagging comments raises those comments for site moderator attention. What's the difference between flagging a comment and flagging a user? Flagging a comment raises that one comment to the attention of the site moderator. Flagging a user raises the entire account to the attention of Disqus. When flagging a comment, consider the community guidelines of the site where the comment was posted. When flagging a user, consider the Basic Rules of Disqus.